Dainty Dollymix UK Beauty Blog: Kelly Cutrone Book Signing At Illamasqua! Thats right ladies, you read correctly! 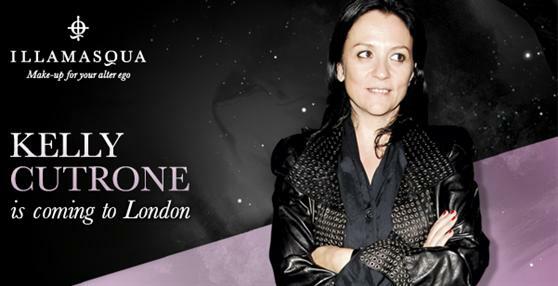 The amazing Kelly Cutrone is coming to London for a book signing at the one and only Illamasqua store! Kelly Cutrone - a leading figure within the fashion and beauty industry – will be flying to London from her native New York City to visit us at the Illamasqua Flagship Store at 20 Beak Street, London W1 on Monday 18th October. Kelly will be at the Illamasqua Flagship Store at 20 Beak Street, London W1 on Monday 18th October 2010 between the hours of 5:00pm - 6:30pm to exclusively sign copies of her memoir, The New York Times Bestseller, ‘If You Have to Cry, Go Outside; And Other Things Your Mother Never Told You’. I was invited by Illamasqua to meet with Kelly Cutrone before her book signing which would have been a truely amazing experience, but i cant make it which i am truly gutted about! I absolutely loved her in both The Hills & The City! Are you planning on going? If so, let me know...and make sure you take lots of pictures! Ahh, I ADORE her. I would of loved to of gone! Damn uni.. and the fact that I live in Wales. Sorry you can't make it either :( that would of been an amazing experience! Im jealous. I wish she was coming somewhere close to where I live. love your blog ! ! ! Has any one read it? !